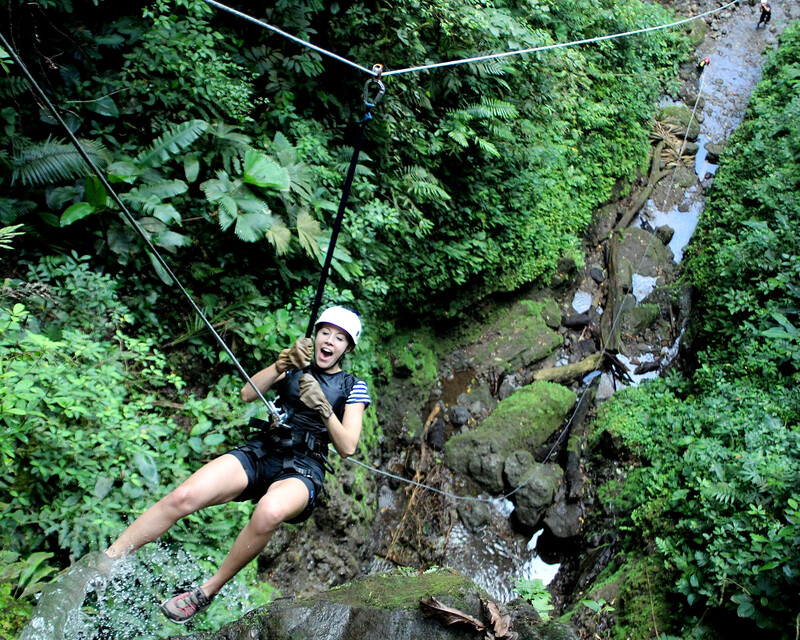 Canyoneering, or canyoning, is quickly becoming one of the most popular adventure/adrenaline sports in Costa Rica. Canyoning combines rappelling, down-climbing, scrambling, and wading/swimming into one extremely exhilarating experience. With its jagged landscape, raging rivers, deep canyons, and breathtaking waterfalls, there’s no question about why Costa Rica is such a hot spot for this rapidly growing sport. Being one of the major adventure hubs in Costa Rica, La Fortuna is a great place to try canyoneering for the first time. Although there are many outfits in La Fortuna that offer canyoning tours, Pure Trek Canyoning and Desafio Adventures are without a doubt fan favorites. We chose Desafio Adventures because they offer the highest rappelling opportunity…a monstrous descent down the face of a 200 foot waterfall! Upon arriving at Desafio’s office, I was immediately impressed with the cleanliness and modern look of the facility as well as the friendliness of the staff. We were kindly offered complimentary coffee (or water) and invited to use their customer computer stations to browse the internet or check email while we waited for the shuttle bus. It’s a short 10-minute ride in a comfortable air-conditioned tour bus from Desafio’s office in the center of La Fortuna to a precarious looking dirt road a mile or so out-of-town. Thankfully, at this point we were transferred to Desafio’s famous “Jungle Limos” for the rest of the bumpy ride up the mountain to the Lost Canyon outpost. At the jungle outpost, we were supplied with all the technical climbing gear we would need for canyoneering, including helmet, (sopping wet) gloves, harness, carabiners, etc. After being fitted with our gear, we were gathered together for a few couples and group photos. Then, our tour leader, Victor, gave us a five-minute course on how to properly rappel and use the rope/carabiner braking system. Finally, we were off on our canyoning adventure! The canyoneering tour consists of four rappels ranging from a tiny 15 foot hop to a whopping 200 foot drop! At 150 ft and 200 ft respectively, descents #2 and #4 definitely provided the greatest thrills of the morning. In between the waterfalls, we hiked along the small stream that meandered through the shadowy canyon enjoying the natural beauty all around us. The Desafio staff also had a couple of “surprises” planned for us in between drops. I’ll just say they were both fun and refreshing! At the end of the canyoning experience there is only one way to get out of the ravine and back to the outpost…climb, climb, climb! I was a little winded by the time I reached the last step but the experience was most definitely worth a little exercise. Rappel #4: 200 ft straight down! Back at the outpost we washed up, changed clothes, and were ready to eat. Desafio Adventures provided a buffet style traditional “tipico” lunch complete with gallo pinto, yuca, picadillo de plantano, chicken & vegetable stew, and cabbage salad. Lunch is included in the price of the canyoning tour and definitely hit the spot. After lunch, we stopped at the makeshift photo desk to peruse through the hundred or so pictures that were taken of us during our 3-hour adventure. We’re not usually the type to buy photo CDs on vacation, but this one is certainly worth the $25. I think we ate one of these for lunch. J/K! I must say that I was very impressed with the staff at Desafio Adventures. Everyone seemed to really enjoy their job and that had a direct impact on the excitement we experienced on this tour. Victor, David, and the rest of the guys really know how to show their guests a good time. Thanks to all the Desafio staff for a fantastic Costa Rican canyoneering experience and money well spent! Bring a good pair aqua/hiking shoes or tennis shoes. Bring a change of clothes…you’re going to get wet! You’re hiking in the middle of the rainforest. Don’t forget the bug spray. Recommended but not required…a helmet cam! Oh, I wish I had one on our tour! Finally, go canyoneering with Desafio Adventures…these guys are awesome! Looks total fun and exciting. Thanks for sharing! It was a total blast! If I went back to Costa Rica and could only do one excursion, that would be it! Thanks for the comment. looks like a lot of fun!! I wish I could go there someday. Pingback: Costa Rica whitewater rafting at Arenal Volcano.